Whipped Raspberry Honey Butter and we are off! Tomorrow we leave for what is sure to be an adventure – a ten-day road trip around Nova Scotia and PEI, hitting as many ocean views, beaches, and lighthouses as we can. You can follow along on Twitter, Facebook and Instagram for the up-to-the-minute reports, a peek at our current views, and, of course, snapshots of what we’re eating. And I’ll be bringing a full report to the blog when I return home, complete with recommendations and our best tips for seeing the Maritimes with small children. We’re ready for a change of scenery and are eager to smell the sea. It will be my first visit to Canada’s East Coast. About time, don’t you think? I’ve been unable to resist the call of the impeccable fresh produce at the markets these days, which is why I was left with a basket of raspberries to use up right before our trip. I could have frozen them, but instead whipped up a batch of raspberry honey butter and froze it in two jars. This pale pink spread takes all of five minutes in a food processor and lasts for several months in the freezer, waiting for the perfect pancake breakfast or brunch with fresh scones. I stew my berries (it works with blueberries, too) with a spoonful of honey before combining the simple compote with butter and creaming in into submission. Our local u-picks are all advertising for ‘framboise‘ but I will have to wait until after our little trip to visit the berry patch. Why are there always so many items on a summer bucket list? It’s nearly impossible to hit them all. At least I can check off raspberry butter. It’s hard to imagine a better accompaniment to my morning toast. 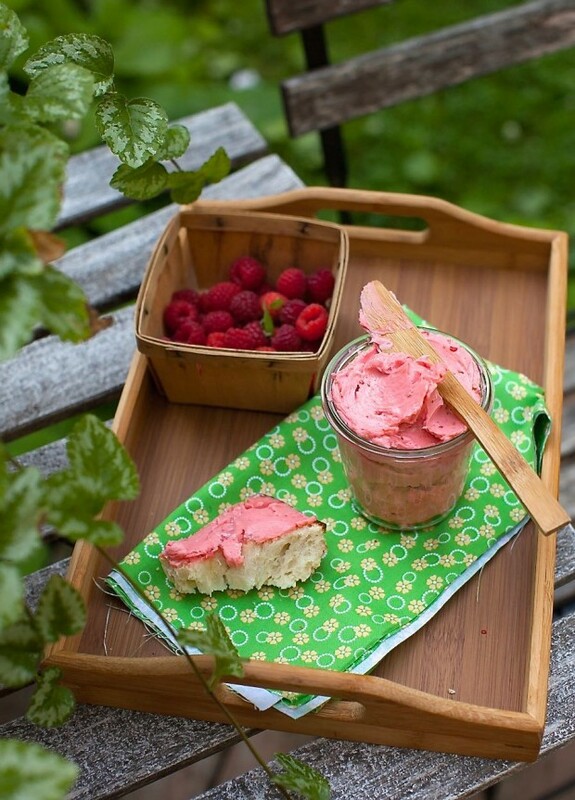 Breakfast just got better with a pretty pink raspberry honey butter. Melt honey in a small sauce pan and add the raspberries. Bring honey to a boil and mash the berries with a fork. Set aside to cool completely. In a food processor or stand mixer, combine raspberry-honey compote and butter and whip for 2-3 minutes until is is fluffy and smooth. 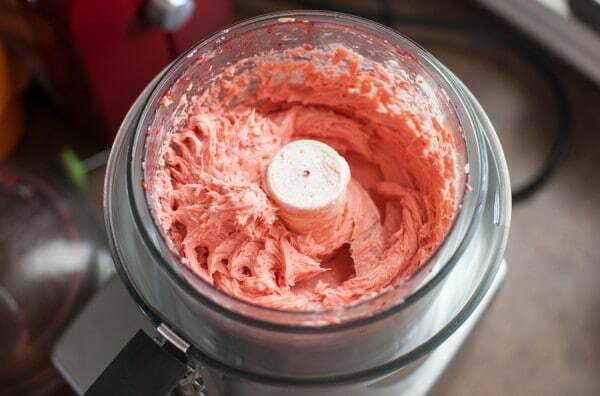 You will have to stop the food processor and scrape down the sides with a spatula once or twice. When it is smooth, stop processor and scrape into a small jar. Refrigerate for up to one week or freeze for two months. I’m bringing in a few guest posters while I am gone, so you are in for a treat. They are, respectively, experts in their own fields and will touch on topics that I am unfamiliar with such as lacto-fermenting and paleo cooking, so watch for them coming soon! What’s left on your summer bucket list? This looks yummy! I have a flat of strawberries that I bought from the market (the everbearing type) to make your strawberry rhubarb honey jam (I ran out of pectin so I will be doing that this afternoon! )…but I have loads so I will try this butter with them. I made compound butter once but never thought to freeze it…you are brilliant! Have fun on you trip. That sounds like so much fun!! This is one incredible butter. Honey and raspberries mixed with butter? That sounds amazing. I have to make this! 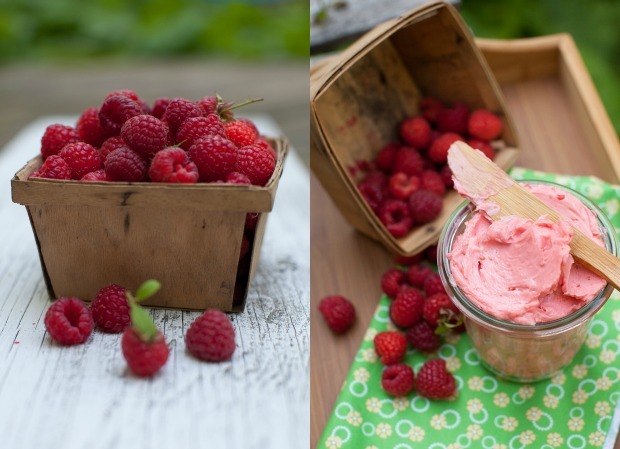 Brilliant – I’m picturing a whole fridge full of whipped fruit butters! Does the mixture seep or separate with time? This recipe is simply brilliant! We’re off to pick raspberries this morning. A friend asked us to tend her garden while they are away on holiday. And now your raspberry honey butter is calling my name! Never ever have tried anything like this, wonderful idea. How long does this keep? This might be a great idea for a brunch party..
Oh, goodness! This butter sounds amazing! Have fun in the Maritimes! If you find yourself in the Annapolis Valley, check out the Saturday farmer’s market in Annapolis Royal, or in Wolfville. The Wolfville farmer’s market does a Market dinner on Wednesday nights that is wonderful, communal and full of delicious local offerings. I made a batch of cranberry syrup last week, and could not bring myself to throw out the berries left in the strainer (though I very carefully followed Marisa’s directions and did not push down on them to extract more goodness even though I really really wanted to). I just made cranberry butter with the leftovers from the cranberry syrup venture! I rolled my butter into logs and froze it in a package, and now we’ll have pancakes with cranberry butter and cranberry syrup this winter. Whoa, that sounds and looks amazing! I love the different take on a fruit spread. I can’t get over the lovely color of this raspberry butter! It sounds like such a lovely, summery way to add color & a different flavor to muffins, scones and pancakes. Perfect 🙂 Enjoy what sounds like an incredible trip! Can’t wait to read the posts by your guest bloggers! And as for my bucket list? I’m hoping to get to even out the remnants of the awkward sunburn (now tan) lines from my trip to Hawaii and to escape the city to go pick fruit or berries of some sort! How does the texture compare after it’s been frozen and thawed? I love the idea of this, and would love to get some packed away for chilly days, but am concerned the butter won’t hold up well.